With the vision of the President, to plant trees islandwide, a new “tree planting auspicious time” has been introduced to this year’s Sinhala and Tamil New Year rituals, which falls on the 15th of April at 11.17 a.m. Supporting this worthy cause, selected DFCC Bank branches will distribute plants during April 11 and 12 to customers who deposit any amount into any deposit account, excluding current accounts. Plants will be distributed on a ‘first come first served basis’. 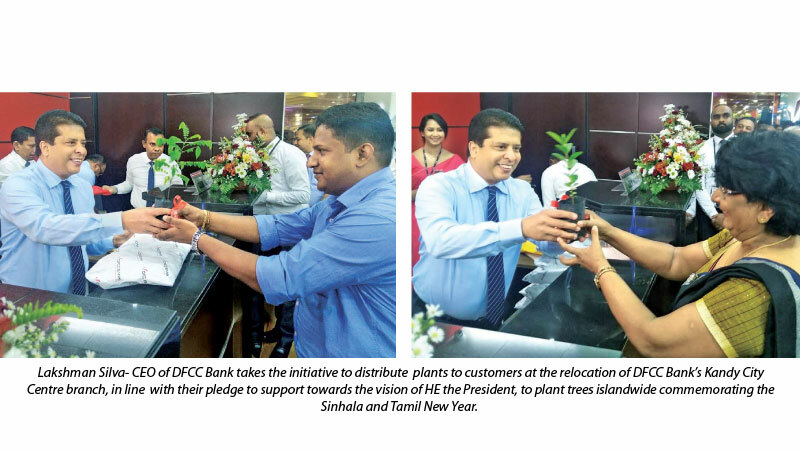 In the recent past, DFCC Bank has collaborated with Reforest Sri Lanka, a non-profit society committed to protect and extend the forest cover in Sri Lanka. The Bank has also launched a commemorative staff tree-planting initiative where a tree is planted to celebrate each and every staff member’s birthday. They also receive an e-tree dedication certificate after the tree planting campaign, which provides the link to find the exact location of the planted tree on Google Maps. These tree-planting programmes are attended by staff members and their families, as well as members of the local community, who come together to support the Bank’s initiative. The trees planted will help to reforest key areas across the island, whilst giving back to the planet at large. DFCC Bank PLC is a fully-fledged commercial bank offering the full gamut of commercial and development banking services. The Sri Lanka Institute of Management Accountants (CIMA) and the International Chamber of Commerce of Sri Lanka (ICCSL) has announced DFCC Bank as one of the ten “most admired companies” in Sri Lanka for 2018.